It's true. 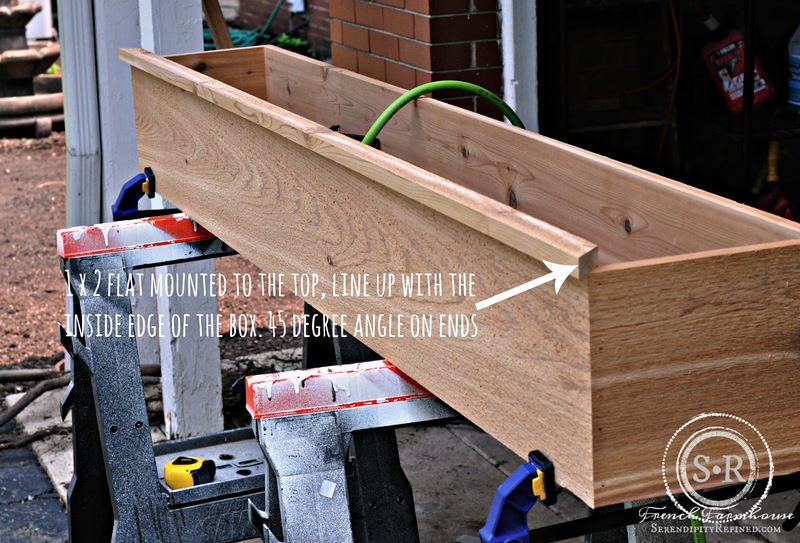 I chose mid-July to build a cedar window flower box for the farmhouse. I know that may sound crazy but I was bored...and local nurseries are closing out their summer flowers. At 50% off, the cost of filling the nearly seven foot long flower box wasn't bad. Rather than purchasing a bunch of individual flowers, I simply filled the box with four hanging baskets! 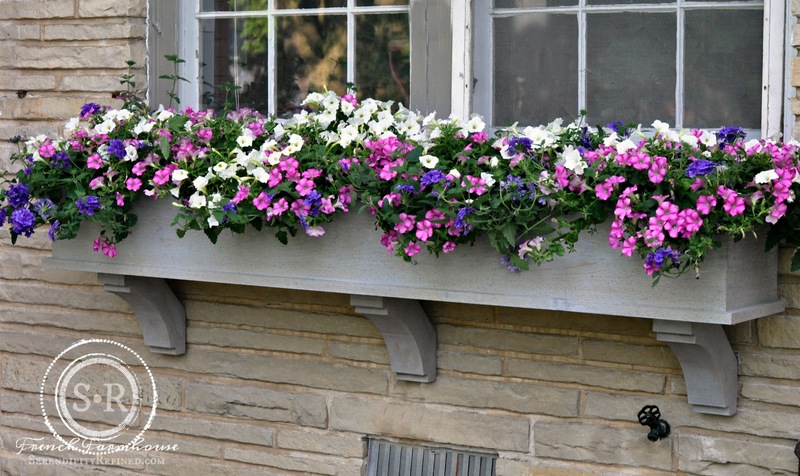 There is no formal plan for this window box. It's one that I made up over 25 years ago. We have built this same style window box for one of our former homes, the home of some friends of ours, and now, the farmhouse. It's simple to make. 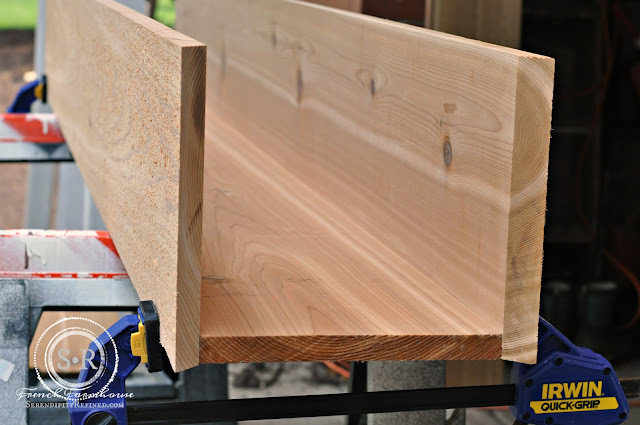 The sides and bottom are 1" x 10" (actual measurement 3/4" x 9 1/4") rough cedar which was ripped down from a 1"x 12" board because lets face it, cedar isn't cheap and it was less expensive to have it ripped down and use the cut-offs for the trim pieces. 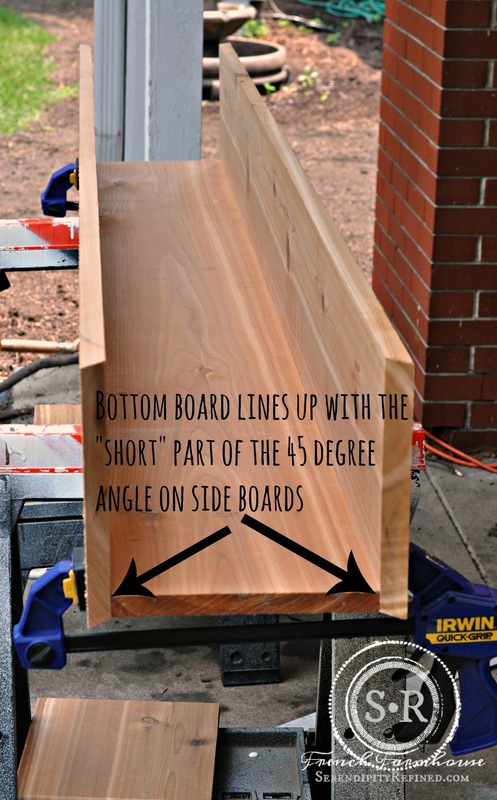 (2) 1" x 10" x 10 3/4"(to the long point) with 45 degree cuts on each end to be used for ends. (2) 1" x 2" x 79 3/4"(to the long point) to be flat mounted to the top of the box . Cut the 45 degree angle across the wide part of the board. Note: I used only one since mine is mounted against a stone ledge. 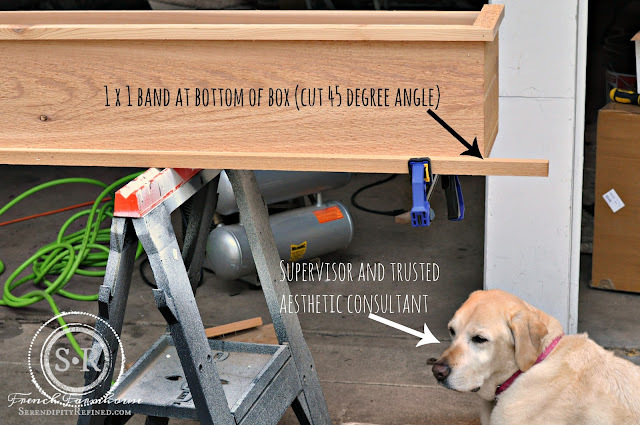 (2) 1" x 2" x 13 1/4" (to the long point) to be flat mounted on the top of the box at the ends. Note: I cut mine flush on the back since mine is mounted against a stone ledge. (2) 1" x 1" x to be mounted as a band along the bottom of the ends of the box. 45 degree angle on each end. Cut the boards and assemble the box using clamps, wood glue and 2 inch brad nails. I used an air nailer. If you are hand nailing, use 2 inch finishing nails, predrill the holes and counter sink the heads just below the surface so that you can fill the holes with wood filler. 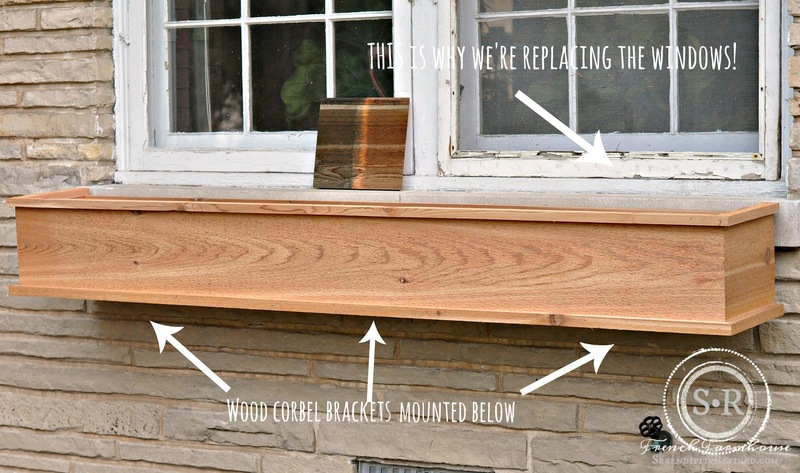 Attach the window box to the house using "L" brackets or wood brackets. I ordered my cedar wood brackets here. They are 4 inch rough sawn western red cedar and they were here within six days. I shimmed the box away from the house using a cedar 2" x 6" which was screwed into the mortar joints just below the limestone ledge beneath the window. (You can see this in the first photo.) This gave me a good spot to anchor the window box to the house and filled the space behind it to ensure that hornets didn't nest between the box and the house. To attach the wood corbels to the house, I drilled a 1/4" hole through the bottom of the bracket into a mortar joint between the stones. I inserted a plastic anchor then countersunk the holes using a 1/2" bit and screwed the brackets to the house using a 3 inch screw. I filled the holes using 1/2" cedar plugs that I made using a hole bit. The box was finished using SuperDeck semi-transparent oil based stain in Weathered Gray. This will be the color for the entire exterior of the farmhouse when we put up the new cedar siding. In the photo below, you can see that part of the window frames are painted gray. I've decided on a medium charcoal gray for the exterior windows. There you have it. 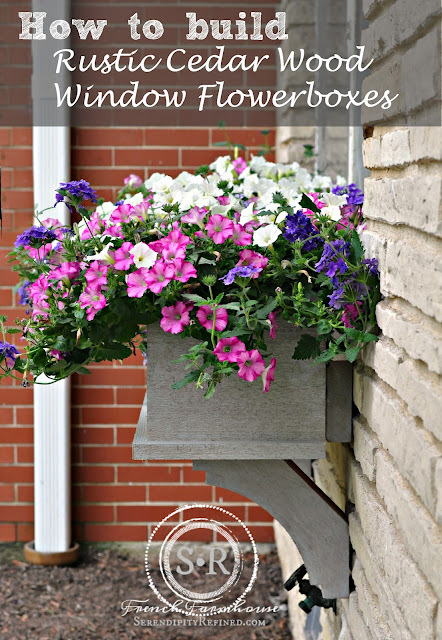 Easy DIY directions for how to build a rustic, rough sawn cedar, window flower box and the secret to filling it: four 10-inch hanging flower baskets! As always, if you decide to build one, I'd love to see it and if you have any questions or comments, please let me know!